There are few prospects so replete with romantic possibility—so entirely suited to a soul trembling in morbid awe—as the ruins of an English Abbey. Picture, if you will, the tumbled stones where once a tonsured friar muttered matins; the echoing coruscation of the cloister, now opened to the sky; the soaring architraves of Gothick stone that oppress one’s soul as with the weight of tombs. Vanished incense curling at the nostril—the haunting memory of chanted prayer, sonorous and unintelligible to an ear untrained in Latin—the ghostly tolling of a bell whose clapper is muted now forever! Oh, to walk in such a place under the chill of moonlight, of a summer evening, when the air off the Solent might stir the dead to speak! In such an hour I could imagine myself a heroine straight from Mrs. Radcliffe’s pen: the white train of my gown sweeping over the ancient stones, my shadow but a wraith before me, and all the world suspended in silence between the storied past and the prosaic present. Engaging as such visions must be, I have never ventured to Netley Abbey—for it is of Netley I would speak, it being the closest object to a romantic ruin we possess in Southampton—in anything but the broadest day. I am far too sensible a lady to linger in such a deserted place, with the darkling wood at my back and the sea to the fore, when the comfort of a home fire beckons. Thus we find the abyss that falls between the fancies of horrid novels, and the habits of those who read them. “Yes, George?” I glanced towards the bow, where my two nephews, George and Edward, surveyed the massive face of Netley Castle as it rose on the port side of the small skiff. “‘Tis a Solent fort, you young nubbins,” grunted Mr. Hawkins, our seafaring guide. “Built in King Henry’s time, when the Abbey lands were taken. In a prime position for defending the Water, it is; they ought never to have spiked those guns. “But we have Portsmouth at the Solent mouth, Mr. Hawkins,” Edward observed, “and must trust to the entire force of the Navy to preserve us against the threat from France.” The elder of the two boys—fourteen to George’s thirteen—Edward prided himself on his cool intelligence. As my brother’s heir, he was wont to assume the attitudes of a young man of fortune. My nephews had come to me lately from Steventon, after a brief visit to my brother James—a visit that I am certain will live forever in their youthful memories as the most mournful of their experience. I say this without intending a slight upon the benevolence of my eldest brother, nor of his insipid and cheeseparing wife; for the tragedy that overtook our Edward and George was entirely due to Providence. Nearly a fortnight has passed since a messenger out of Kent conveyed the dreadful intelligence: how Elizabeth Austen, the boys’ mother and mistress of my brother Edward’s fine estate at Godmersham, had retired after dinner only to fall dead of a sudden fit. Elizabeth! So elegant and charming, despite her numerous progeny; Elizabeth, unbowed as it seemed by the birth of her eleventh child in the last days of September. The surgeon could make nothing of the case; he declared it to be improbable; but dead our Lizzy was, despite the surgeon’s protestations, and buried she has been a week since, in the small Norman church of St. Lawrence’s where I attended her so often to Sunday service. I suspect that too much breeding is at the heart of the trouble—but too much breeding is the lot of all women who marry young, particularly when they are so fortunate as to make a love-match. Elizabeth Bridges, third daughter of a baronet, was but eighteen when she wed, and only five-and-thirty when she passed from this life. With her strength of character, she ought to have lived to be eighty. It remains, now, for the rest of us to comfort her bereaved family as best we may. My sister Cassandra, who went into Kent for Elizabeth’s lying-in, shall remain at Godmersham throughout the winter. Dear Neddie bears the affliction with a mixture of Christian resignation and wild despair. My niece Fanny, who at fifteen is grown so much in form and substance as to seem almost another sister, must shoulder the burden of managing the younger children, for the household is without a governess. There is some talk of sending the little girls away to school, that they might not brood upon the loss of their mamma—but I cannot like the scheme, having nearly died when banished as a child to a young ladies’ seminary. The elder boys, Edward and George, endured their visit to brother James at Steventon and appeared—chilled to the bone with riding next to Mr. Wise, the coachman—on Saturday. They are bound for their school in Winchester on the morrow. Their happiness has been entirely in my keeping during this short sojourn in Southampton. I have embraced the duty with a will, for they are such taking lads, and the blight of grief sits heavily upon them. They forget their cares for a time in playing at spillikins, or fashioning paper boats to bombard with horse chestnuts. The evening hours, when dark descends and memory returns, are harder to sustain. George has proved a restless sleeper, crying aloud in a manner more suited to a child half his age. He will be roundly abused for weakness upon his return to school, if he does not take care. My mother, I own, finds the boys’ spirits to have a shattering effect upon her nerves, which invariably fail her in moments of family crisis. No matter how diligently Edward might twist himself about in our reading chairs, engrossed in The Lake of Killarney, or George lose a morning in attempting to sketch a ship of the line, their exuberance will drive my mother to her bed-chamber well before the dinner hour, to take her evening meal upon a tray. Yesterday, I carried the boys up the River Itchen in Mr. Hawkins’s skiff, and stopped to examine a seventy-four that is presently building in the dockyard there. The place was a bustle of activity – scaffolding and labourers vied for place in a chaos of scrap wood and iron tools—and left to myself, I should not have dreamt of disturbing them. But under the chaperonage of Mr. Hawkins, a notorious tar known to all in Southampton as the Bosun’s Mate, we received a ready welcome from the shipwright. Mr. Dixon is a hearty fellow of mature years and bright blue eyes who takes great pride in his work. He scrutinized my nephews’ faces, well aware that nothing more was required to command their full attention than the spectacle of the seventy-four. The great third-rate towered above our heads, her keel a massive construction of elm to which great ribs of oak were fixed. She was nearly complete, the decks having been laid and the hull partitioned into bulkheads, powder magazines, store-rooms, and cabins, with ladders running up and down. The Itchen yard is ideally suited for such a ship, for the river water flows in through a lock, and the finished vessel may float down to Southampton Water in time. “Are such things so common?” I murmured to Mr. Hawkins. “When is she to sail, Mr. Dixon?” George enquired. A dark-skinned, lanky fellow with jet-black hair ran up and salaamed, in the manner of the East Indies. A Lascar! The boys, I am certain, had never encountered a true exotic of the naval world—one of the renowned sailors of the Seven Seas. I smiled to see Edward’s expression of interest, and George’s of apprehension. Mr. Dixon slapped my nephews on the back so firmly George winced. “Get along with ye, now. The Lascar won’t bite. Refuses even to touch good English beef, if you’ll credit it; but he’s a dab hand with a plane and a saw. Nearly an hour later we bid Mr. Dixon goodbye, and Mr. Hawkins turned his skiff towards home. Yesterday’s water party proved so delightful, however—so exactly suited to my nephews’ temperaments and interests—that on this morning, their last day of liberty, I was determined to get them once more out-of-doors. The abbey ruins, and the scattered habitation that surrounds them, lie southeast of Southampton proper, just beyond the River Itchen. In fine weather, of a summer’s afternoon, one might walk the three miles without fatigue; but with two boys on my hands, and the weather uncertain, I had thought it wiser to make a naval expedition of our scheme. As the diminutive craft bobbed and swayed under the boys’ restless weight, I feared I had chosen with better hope than wisdom. “Sit ye down, young master, and have a care, or ye’ll pitch us all over t’a gunnels!” Mr. Hawkins growled at George. Mr. Hawkins is not unkind, but exacting in matters nautical. I grasped the seat of George’s pantaloons firmly; they were his second-best, a dark grey intended for school in Winchester, and not the fresh black set of mourning he had received of our seamstress. The Bosun’s Mate maneuvered the skiff into a small channel that knifed through the strand, and sent the vessel skimming towards shore. Above us rose Netley Cliff, and the path that climbed towards the Abbey. “That’ll be Netley Lodge.” Hawkins thrust a gnarled thumb over his shoulder as he rowed, in the direction of a well-tended, comfortable affair of stone that hugged the cliff’s edge. “Grand place in the old days, so they say, but nobody’s lived there for years. “Perhaps a wandering ruffian has taken up residence,” George suggested hopefully. A freshening wind lifted Edward’s hat from his head, and tossed it into the shallows; he scrambled from the boat in outraged pursuit. I breasted the hill, and caught my breath at the sight of the Abbey ruins: the church standing open-roofed under the sky; the slender shafts of the chancel house and the broken ribs of the clerestories; the grass-choked pavement of the north transept; and the cloister court, where wandering travellers once knocked at the wicket gate. A tree grows now in place of an altar. Ivy twines thick and green about the arched windows, as though to knit once more what the ages have unravelled. A futile hope: for all that time destroys, cannot be made new again, as my poor George and Edward have early discovered. The boys plunged into the ruined church, and continued their game of pursuit; I proceeded at a more measured pace. I have come to Netley often enough during my residence in Southampton, but familiarity cannot breed contempt. This place was built by the good monks of Beaulieu in 1239, and throve for more than three hundred years as only the Cistercian Abbeys could: wealthy in timber, and in the fat of the land; a center of learning and of prayer. There are those who will assert that by the reign of King Henry the Eighth, prayer was much in abeyance; that but a single volume was found in the library at the Abbey’s dissolution; and that the monks were more eager to ride to hounds – hence the name of the neighbouring hamlet—than to offer masses for their benefactors. King Henry dissolved the monasteries of England in 1537, and with them, Netley; and the yearly income from all the property thus seized was in excess of a million pounds. Henry used his booty to political effect, rewarding his supporters with rich grants of land; and Netley Abbey was turned a nobleman’s manor. There is an ancient legend in these parts that one wellborn lady, forced into the veil, was walled up alive in the Abbey walls; but though many have searched for the lady’s tomb, no one has ever found it. There are stories, too, of scavengers among the Abbey’s stones, struck dumb and blind in attempting to lift what was not theirs. Whether haunted or no, the manor did not prosper, and ended, with time, as a blasted testament to King Henry’s ambition. I have long been partial to the Roman Catholic faith, as the object of devotion of no less a family than the Stuarts: maligned, neglected, and betrayed by all who knew them. I must admit, even still, that Henry’s seizure of monastic property, and its eventual decay, has proved an invaluable contribution to the beauties of the English landscape. Do spirits walk among the fallen timbers of this house? Do they mourn and whisper in the moonlight? I have an idea of a shade, poised upon the turret stair, her white habit trailing. Absurd, to feel such a prickling at the neck in the middle of the day—to pace insouciantly down what had once been a sacred aisle, as though under the gaze of a multitude; to listen attentively to birdsong, aware that the slightest alteration of sound might herald an unwelcome intruder. 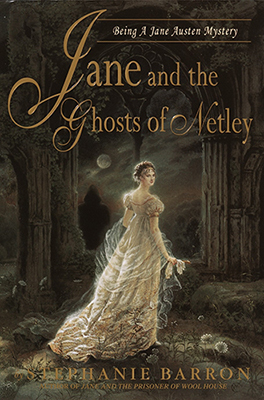 Ladies have often called upon the ghosts of Netley—there is nothing strange in this…. In the distance, I heard young Edward’s shout of triumph and George’s, of despair. The birds continued to sing; a shaft of sunlight pierced the ruined window frame, and a breath of wind stirred the ivy. I traversed the south transept and turned for the turret stair, which winds upwards into the sky—the turret itself having crumbled—and gives out onto the Abbey’s walls. Here one may walk the perimeter of the ruin, with a fine view of the surrounding landscape. My head into the wind, I paced a while and allowed myself to consider of Elizabeth. I am not the sort to indulge in grief; I have known it too often and too well. The older I become—and I shall be three-and-thirty this December—the more I take Death in my stride. I have not yet learned, however, to accept the caprice of its whims—nay, the absurdity of its choice, that would seize a young woman of health, beauty, prospects, and fortune, a young woman beloved by all who knew her—and yet leave Jane: who am possessed of neither fortune nor beauty nor a hopeful family. I live as but a charge upon my relations. Would I, in a spirit of sacrifice, exchange my ardent pulse for Lizzy’s silent tomb? If a bargain could be made with God—a bargain for the sake of young Edward and George, or the little girls so soon to be shut up at school—a bargain for dear Neddie, crushed in the ruin of his hopes—would I have the courage to strike it? I cast my eyes upon the flat grey sheen of Southampton Water—on the smoking chimneys of Hound, tumbling towards the sea; on the distant roofs of Southampton town, glinting within its walls. Dear to my sight, who am selfish in my grasp at life. Forgive me, Lizzy. Though I loved you well, I cannot wish our lots exchanged. The boys’ voices had grown faint. Thunder pealed afar off, from the easterly direction; the unsteady day had dimmed. I descended the turret stair, grasping with my gloved hands at outcrops of broken stone, and sought my charges in the ruined refectory. This was a groined chamber seventy feet long, lit by windows on the eastern side. For nearly three hundred years the Cistercians had dined here in silence, with their abbot at their head. The remains of a fresco adorned one wall, but the fragile pigments had worn to nothing, and the saints stared sightless, their palms outstretched. The refectory was empty. Just beyond the range of vision, a shadow moved. Light as air and bodiless it seemed, like a wood dove fluttering. My heart in my mouth, I swiftly turned: and saw nothing where a shade had been. The sound of a footfall behind me—did a weightless spirit mark its passage in the dust? Not a ghost or envoy of the grave; no monk concealed by ghoulish cowl. A man, rather: diminutive of frame, lithe of limb, with a look of merriment on his face. A sprite, indeed, in his bottle-green cloak; a very wood elf conjured from the trees at the Abbey’s back, and bowing to the floor as he surveyed me. “You have the advantage of me. I turned over the parchment and studied the seal. It was nondescript, of a sort one might discover in a common inn’s writing desk. No direction was inscribed on the envelope. I glanced at the sprite, but his raffish looks betrayed nothing more than a mild amusement. A name for heroes of ancient verse, or lovers doomed to wander the greenwood. Either meaning might serve. Lord Harold Trowbridge. Suddenly light-headed, I broke the letter’s seal. There was no date, no salutation—indeed, no hint of either sender’s or recipient’s name—but I should never mistake this hand for any other’s on earth. From the curious presentation of this missive, you will apprehend that my man has been instructed to preserve discretion at the expense of dignity. I write to you under the gravest spur, and need not underline that I should not presume to solicit your interest were other means open to me. Pray attend to the bearer, and if your amiable nature will consent to undertake the duty with which he is charged, know that you shall be the object of my gratitude. Without another word, he led me back to the turret stair, and up into the heights. I narrowed my weak eyes, followed the line of his hand, and discovered the trim brig as it came about into the wind. “That is my office, ma’am. He who would serve as valet to Lord Harold Trowbridge, must also undertake the duties of dogsbody, defender—and spy.” He threw me a twisted smile; bitter truth underlay the flippant words. Lord Harold’s mother, Eugenie de la Falaise, formerly of the Paris stage and wife to the late Duke of Wilborough, had passed from this life but a few days ago. I had admired Her Grace; I mourned her passing; but I could not have read the Morning Gazett’s black-bordered death notice without thinking of her second son. It had been more than two years since I had last enjoyed the pleasure of Lord Harold’s notice; and though I detected his presence from time to time in the publicity of the newspapers, I have known little of his course since parting from him in Derbyshire.